Many people congratulated Serena Williams after she showed off her baby bump on social media last week. 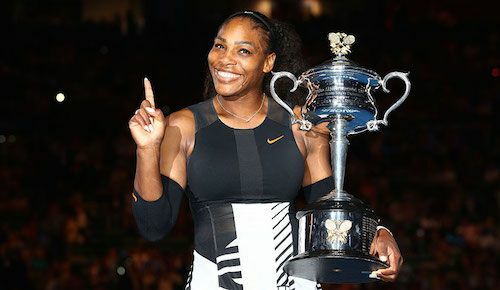 But the revelation that she may well have been pregnant at the time of her Australian Open win in January provoked a wave of criticism that painted the tennis champion as reckless, calculating or a show-off. Several writers penned quasi-investigative pieces designed to diminish Williams' victory. Live Science questioned the athlete's personal choice and suggested playing sports could be hazardous to a pregnancy. It only deemed it safe after issuing a plethora of warnings, provisos and ambiguous language. Meanwhile, an Australian news site took a sudden interest in pregnancy research, speculating Williams may have become pregnant to gain an advantage on the court. It compared the cardiovascular changes of early pregnancy to the effects of 'blood doping', or boosting an athlete's red-blood-cell count to enhance his or her performance. The clear insinuation was that Williams participated in a legal form of cheating, and may have gotten pregnant to gain a competitive edge. Commentators also rushed to compile lists of other women who competed while pregnant, and defend 'ordinary' women who feel weak and fatigued during pregnancy. Although the former piece's goal may have been to provide historical context, and the latter to highlight Williams' extraordinary drive and fitness, both seemed to tackle claims the athlete never made: that she was a pioneer in pregnant sport or better than other women. The simple act of sharing the news of her pregnancy thrust Serena Williams into a crossfire of character assassinations presented through doublespeak. The intense scrutiny of Williams' body could be rooted in sexism. Pregnant women have endured unfair treatment and monitoring of their bodies for centuries - a practice that limited their liberties and even threatened their livelihoods until the Pregnancy Discrimination Act of 1978. The uncomfortable attention could also be a product of racism, an argument that gained credence after Romanian rival Ilie Nastase was caught on tape speculating about the “chocolate with milk” skin colour of Williams’ unborn mixed-race child - a nod to centuries of racial objectification. Moreover, white beach-volleyball champion Kerri Walsh Jennings - who was five-weeks pregnant when she won Olympic gold in 2012 - didn't face an onslaught of claims and questions.